The GW men’s tennis team turned out a second-place finish at this weekend’s Atlantic 10 Tournament in Pittsburgh, where the Colonials defeated Fordham and Xavier before falling to tournament winner Richmond in the final round. Coming into the tournament Friday with a 14-6 record, Colonials power had strengthened, and the team’s performance had improved as the spring season picked up. The Colonials had won their last eight games heading into Pittsburgh, highlighted by a 4-3 victory over St. Bonaventure April 6. Seeded second in the conference behind Richmond, GW faced Fordham on Friday and defeated the Rams 4-1. The Colonials swept the doubles matches to earn the first point. GW allowed its opponent a win at No. 2 singles where Fordham’s Chris Kelly defeated GW freshman Jake Jopling. The Colonials claimed victories at No. 1 singles, where Matt Hane defeated Mark Carducci 6-3, 6-4. Kinzie Wright defeated Josh Krieg 6-4, 6-2 at No. 4 singles. Chris Moulton defeated Jay Himmelstein 6-0, 6-1 at No. 6 singles. The Colonials won at No.1 doubles, where Hane and Kinzie Wright defeated Mark Carducci and Andrew Salak 8-5, and at No. 3 doubles, where Jopling and Brett Warner defeated Nick Smalc and Joe Greco 8-3. 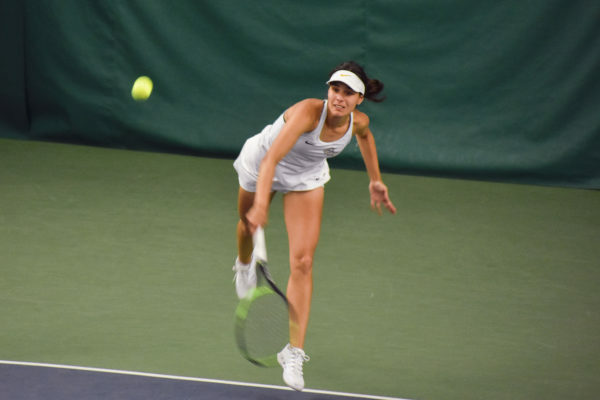 The win set the stage for a match against Xavier, which had just beaten Duquesne 4-2 in the earlier round. Winning two doubles matches allowed GW to escape with a narrow 4-3 win after the teams split three matches apiece in singles play. Hane defeated Rob Bakker 4-6, 6-1, 6-3 in a key No. 1 singles match, followed with wins by Matt Treadgold, who defeated Brent Lehring 4-6, 6-2, 6-0, and Moulton, who defeated Scott Triplett 6-3, 2-6, 6-2. Hane and Kinzie Wright won at No. 1 doubles, defeating Lehring and Brad Meadors 9-7. Kevin Wright and Treadgold won at No. 2 doubles. 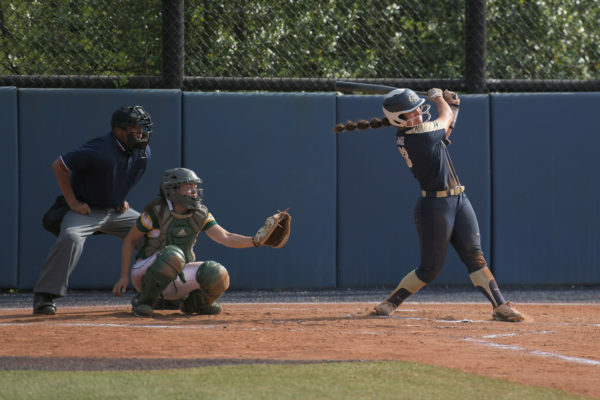 The weekend’s decisive match came down to GW’s showdown against Richmond on Sunday in the third and final round of the tournament, which would determine its champion. Richmond lived up to its expected strength and defeated the Colonials, 4-2, putting GW in second place at the A-10 tournament. Richmond earns an automatic bid to its first-ever National Championships. Richmond, which joined the A-10 this year, defeated its conference opponents 30-6. GW, which improved on its fourth-place finish at last year’s A-10 tournament, succeeded at Nos. 1 and 3 singles where Hane and Treadgold defeated opponents, 6-3, 6-2, and 6-2, 6-4 respectively. This article appeared in the April 15, 2002 issue of the Hatchet.